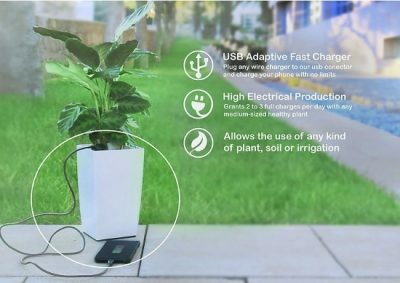 From next week we can charge any mobile device with just one cable, the typical decorative pot present at any home or office and the charger developed by three Spanish students that takes advantage of photosynthesis to generate energy. Pablo Manuel Vidarte and Rafael Rebollo, students of multimedia engineering, and Javier Rodriguez, studying nanotechnology form the technical team of a group of Spanish young people who have designed Bioo a charger for mobile phones that gets energy from the photosynthesis of plants. It is small in size, stone shaped the size of a finger and they plan to begin selling it next week on their website. With a pot of 21x11x11 cm dimensions, the Bioo user can recharge is mobile phone from two to three times per day, even at night. ” The biological cell covered by a semi impermeable grid is inside the pot and above this is the stone with a wire that goes into the system. You just need to add water, shake, and put soil on top,” says to EnergyNews Pablo Manuel Vidarte. The ability to recharge Bioo depends on the plant used because “not all plants carry out photosynthesis in the same way. A cactus will generate less –would only allow a load per day- than a papyrus plant, for example,” says Pablo. The most optimal specimen found as for its generation capacity is the Whatsonia, native to southern Africa but according to the team it is perfectly compatible with our climate. “We use the substances that the plant secretes naturally by photosynthesis both in the light phase and in the dark phase. These substances are stored in the biological battery that we have created where a number of microorganisms are in charge of decomposing their molecules resulting in electrons being released, “he explains. They are also working on a project to supply energy to households through vegetal panels. To get an idea, this technology can generate up to 40 watts per square meter of crop.